Heliconias, one of the world’s most spectacular tropical plants! Dramatic and magnificent, the inflorescences of the Heliconia are widely sought by many, from the simple gardeners to the commercial growers catering for the cut flower industry, hybridists and so on, all captivated by its bold and exotic beauty! Botanical Name: Heliconia, to be followed by the name of species and cultivar, of which there are more than 200 species and countless cultivars. e.g Heliconia stricta ‘Sharonii’, Heliconia caribaea ‘Black Magic’, Heliconia orthotricha ‘Imperial’ to name a few. Check the Heliconia Society of Puerto Rico for an idea on its many species and cultivars. Common Name: Heliconia (and many other common names as per species and cultivar, e.g Parrot’s Heliconia for H. psittacorum; Lobster claw or Parrot’s beak for H. bihai; Christmas Heliconia for H. augusta ‘Christmas Holiday’). Family name: Heliconiaceae (previously classified under Musaceae, Heliconia now forms the single genus in this family). Plant type: An ornamental herbaceous shrub, originating from the Tropical, Central and South America, and the Pacific Ocean Islands west to Indonesia. Light: Prefers sunlight, especially the H. psittacorum (at least 5 hours direct sunlight) for continuous blooming though less sunlight can be tolerated which result in lush foliage instead. However, there are heliconia species that love semi-shade to full-shade, such as H. stricta and H. pendula. Moisture: Needs regular daily watering for optimum growth. Water twice daily in very hot seasons, otherwise once a day with soil fully wet through is sufficient. Requires high humidity. Soil: Grows best in moist and well-drained loamy soil, enriched with decaying organic matter or leaf compost. Propagation: Can be easily propagated by clump division or rhizomes. It is a simple process whereby a cut is done across a section of rhizome, preferably having at least one visible sucker and then transplanted to a new container or location. New shoots will sprout within 2 months and probably flower within a year. As for the clump division, dig the clump out, remove the stumps of previously flowered stems, divide the remaining ones and replant into new soil. It can also be propagated from seeds, usually by hybridists and serious breeders, but not practical for gardeners as seeds may take a year to germinate with poor success rate. Features: Heliconias are exotic tropical perennial plants native to the Neotropics. They have a clump forming habit that can be dwarf-like (0.5-3 meters tall) or reach unsurprisingly gigantic heights of 4-6 meters, depending on the species and cultivars. Being closely related to the bananas, cannas and gingers, their sometimes large or slender paddle-like leaves can take any of these forms – musoid (banana-like), cannoid (canna-like) or zingiberoid (ginger-like). Some heliconia species like the Heliconia metallica are grown for their beautiful foliage with wine purple underside. However, Heliconias main attraction are the showy and colorful parts of the specialised leaves called bracts and these are what give Heliconias their horticultural value! The small true flowers are contained within these brilliantly colored bracts that vary in sizes, shapes, textures and colors. Only a single inflorescence that can be erect, pendulous or spiraling emerges at the terminal growth of each herbaceous stem (pseudostem) which consists of sheathing leaf petioles that holds the leaves and flower together. Usage: Excellent for tropical garden landscape, and mass plantings in garden beds, borders and parks. Great too for container gardening or as an accent in patio. Some species are excellent choices for container plants that can be grown indoors for the winter or in green houses, and moved outdoors during spring and summer. Their exotic and long lasting ornamental bracts are prized as cut flowers for floral arrangements, even their leaves and herbaceous stems can be included to add uniqueness and artistic beauty. Some regions in the Caribbean even use their leaves for roof thatching or as food wrappers, whilst some natives in Brazil use certain Heliconias’ roots and seeds for medicinal healing properties. Heliconias are also important source of food for hummingbirds, nectar-feeding bats and other insect pollinators. Care: A low maintenance shrub that requires minimal care. Heliconia loves water, so do not allow the soil to dry out completely. Remove yellow and dried leaves, and spent flowers with their pseudostems should be cut to the ground to maintain tidiness. Every 3-4 years when the growth slows down, dig the clump out, divide and replant into new soil to rejuvenate. Heliconias require minimal fertilizing, maybe quarterly or once a month, depending on the species. In fact, burnt edges of foliage can result from excessive fertilizing. For temperate zones: Hardiness – USDA Zone 9a-11, depending on the species. 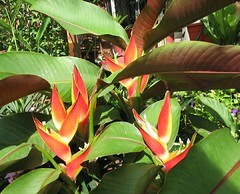 Learn from the gardeners themselves at this forum topic: where and how-to plant heliconia? Also, visit Fairchild Tropical Botanic Garden for more Heliconia information, and view their impressive Heliconia collection. We just love the beautiful vibrant colors and shapes of the Heliconias. Absolutely a must for tropical gardens, be it small or large, that otherwise will seem incomplete! These are some of the heliconia species and cultivars growing in our garden and elsewhere! Heliconia psittacorum ‘Lady Di’ – Erect inflorescence with dark red 5-8 distichous bracts that are paler red on lower cheek, sepals light yellow with distal dark green band and white tip. Vegetation musoid (banana-like leaves). Height 2.5-5 feet. Heliconia psittacorum ‘Sassy’ – Erect flowerhead with 4 to 6 distichous bracts that are pale green or cream proximally and red or pink distally, sepals vivid orange with distal green-black band and white tip. Vegetation musoid (banana-like leaves). Height 2-9 feet. Heliconia psittacorum x spathocircinata ‘Golden Torch’ – Erect inflorescence with golden yellow 4-8 distichous bracts, where basal bract may have green keel and tip, sepals golden with faint green tip. Vegetation musoid (banana-like leaves). Height 3-9 feet. Heliconia stricta ‘Carli’s Sharonii’ – Erect inflorescence. 5-6 distichous bracts, red over most of its glossy bracts, yellow at base and on proximal lip, green on distal lip, tip and generally lighter green on proximal and medial keel, slender basal bracts with green along entire keel; rachis yellow; sepals white with distal dark green bands and white tip; Large oblong banana-like undulate leaves with maroon midrib above and green midrib below, maroon on leaves undersides. 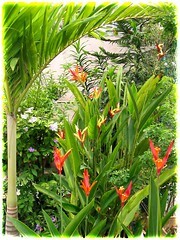 Height 1.5-5 ft.
Heliconia caribaea ‘Purpurea’ or ‘Red’ – It is the red form of Heliconia caribaea. Huge bracts are bright red with a thin yellow proximal lip and green tip. Large banana-like leaves with a white waxy coating on the stems and lower leaf surfaces. The plant is vigorous, erect and clumping, from 8-15 feet tall. Can grow in partial shade to full sun. Blooms from February to November. Heliconia rostrata – An exotic species that is native to Peru and Ecuador in South America. Commonly known as the Lobster Claw, False-bird-of-paradise and Hanging Heliconia, its stunning and long-lasting flowers face downwards, differing from the other heliconias with upright inflorescence. It has banana-like foliage, vigorous-growing, erect and clumping, up to about 7 feet tall. Can grow in partial shade to filtered sunlight. thank you for help and having this site. I have just started to get involved with Heliconias and plan on a tropical garden in my yard but, I need more information for zone 9a since I am in west central florida. I am searching for 1.5 to 4 ft for heliconias and larger 4 to 6 foot plants once they have matured. Any ideas as to where to go? I started to get hummingbirds this year and would like to keep them around. Hello! Where can I buy Haleconia bulbs (varieties) in Miami, Florida? You have a wonderful site, very informative. This is my first visit and I already love it. Most of the plants featured here are present in my garden too. Thank you for your positive comment, Mamta! Do feel free to visit us and enjoy whatever available, yeah! Lowes carriers several heliconia varieties in the outside lawn and garden dept in central FLorida. A few weeks ago we got in the Lobster Claw variety, it is such an amazing plant… Beautiful, Spectacular, Simply Amazing. I had never seen this plant before so it was really cool when I Spotted them in the garden center. hope this helps for those who are looking for the Lobster Claw as well as some of the other varieties and don’t have any idea where they may locate them. Thanks for the thumbs up, Charleen! Can’t agree with you more… Lobster Claw is simply spectacular! Hi Donna. I think the Heliconia species that you’re teaching for is known as Heliconia rostrata or Hanging Heliconia. Sorry, we’re unable to help you as we’re just passionate gardeners and not retailers of garden products.